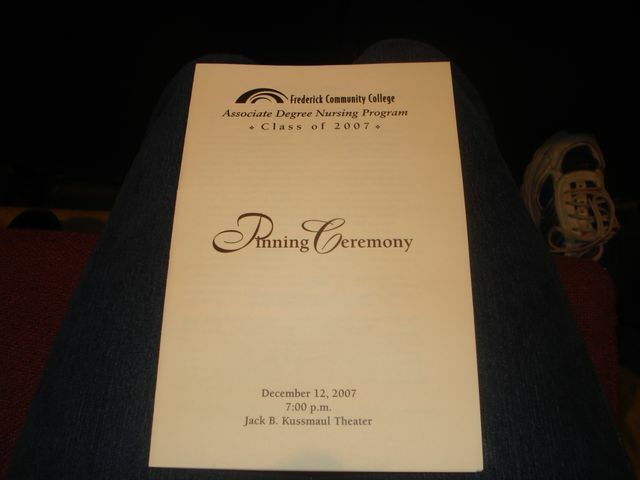 The 2007 (Night/Weekend Option) Senior class of Nursing students graduated from Frederick Community College with a bang tonight! “I solemnly pledge myself in the presence of this assembly to faithfully practice my profession of Nursing. I will do all in my power to make and maintain the highest standards and practices of my profession. I will hold in confidence all personal matters committed to my keeping in the practice of my calling. I will assist the health care team in their work and will devote myself to the welfare of my patients, my family, and my community. I will endeavor to fulfill my rights and privileges as a good citizen and take my share of responsibility in promoting the health and welfare of the community. I will constantly endeavor to increase my knowledge and skills in nursing and to use them wisely. I will zealously seek to nurse those who are ill wherever they may be and whenever they are in need. Tonight was amazing. It was great to feel special and be recognized in such a noble choice of professions among great people. It was too sweet to see my Husband cheering for me, my brother trying to hit on all the other Nursing students, and my daughter, my sweet, sweet Nora who is my best friend, crying out of happiness for my accomplishments. She is a wonder and I was blessed to have her and Jake there. Even Jake told me my graduation was exciting because I was going to be saving lives! How awesome is he? I just hope that I can work hard enough, love my profession enough, and feel passionate enough to continue this journey into a career I admire. I want to do every Registered Nurse justice. I hope I am up to the task. ← There’s a College Graduate in the House! !